Minister for Africa James Duddridge calls on Ethiopian government to increase diversity in parliament and ensure the voices of all citizens are heard. I welcome the fact that the recent Ethiopian parliamentary elections were conducted in a generally peaceful environment and that the Ethiopian people turned out in large numbers. I agree with European Union concerns about the negative impact on the electoral environment of arrests of opposition members and journalists, closure of media outlets, and obstacles faced by the opposition while campaigning. In light of the results I urge the Ethiopian government to explore ways to increase the diversity of political parties in future parliaments, and to ensure those who voted for other parties this time still feel their voice is heard in the next five years. I hope that they will comprehensively address all the issues raised in the African Union Election Observation Mission report. The UK stands ready to offer support which might help in this regard. Follow Foreign Office Minister James Duddridge on Twitter@JamesDuddridge. Follow the Foreign Office on Twitter. 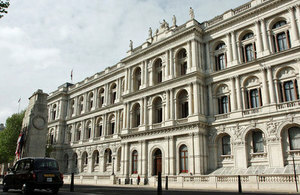 Follow the Foreign Office on Facebook & Google+.